A dense fog was hanging around McBride Springs near 5,000 feet on Mount Shasta at 11 a.m. this morning. Light mist and low visibility continued until above 6,000 feet where the visibility improved to 1/4 mile at 11:30 a.m. near Bunny Flat. Noticeable accumulation of new snow started above 5,500 feet. Two to three inches of soft, slightly moist, new snow sits on top of a deep consolidated snowpack. Short lived snow showers and fog moved in and out with brief periods of clearer sky on a tour up Green Butte. Calm wind below and near treeline allowed for new snow to fall in a nearly strait line to the ground. A light SSW breeze was observed during periods of heavier snow showers around noon. This light breeze was only observed above treeline and was barely strong enough to blow the new snow fall from the sky. It did little to move the snow on the ground that was quickly settling into the snowpack. Small drifts and cornice features have formed on the ridge towards westerly aspects (facing towards Avalanche Gulch). Some blocking and cracking was observed after hard stomping on a small test cornice on the west side of the ridge. Instabilities were confined to the top 4-8 inches and failed on larger precipitation particles above a hard crust that form during the warming period seen last week. Stability tests at 8,100 feet, on a similar west facing 28 degree slope resulted in resistant planar, non-propagating fractures (CT11 RP ↓ 4 inches (10 cm) , CT22 RP ↓ 5 inches (13 cm) ECTN15 ↓ 4 inches (10 cm)). SKY: Broken clouds 80% obscured. Foggy conditions with low visibility < .25 mile would briefly clear to .5 mile between light snow showers. SURFACE PEN: Boot: 6 inches @ 7,800 Green Butte Ridge. Ski: 2-4 inches. 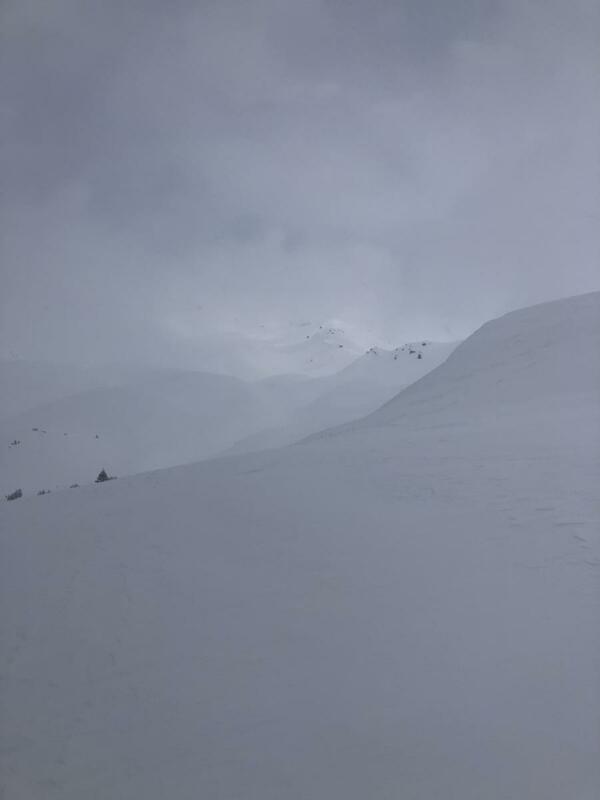 Brief gimps of above tree line conditions. Note: Generally smooth surface texture with some wind effect on the ridges. Small drifts and cornice features have formed on the ridge line towards westerly aspects.